It’s that time of the week again. Yup. Pancake time. This morning when I signed into allrecipes.com the recipe of the day happened to be another pancake recipe. This time it was for Chunky Monkey Pancakes. I knew as soon as I saw it that was what I would be making this morning. I did my workout and burned up those calories so I wouldn’t feel too guilty about eating one of these pancakes. By the time I was done with my workout and had a load of wash going I was ready to eat. Grumpy, unlike me, could wait til almost noon on the weekend to eat breakfast. Me on the other hand, well, I’m up at the crack of dawn and have almost all my housework done along with my workout before 10 AM! About 10:30 I asked Grumpy if he would be ready to eat breakfast. When I said “cakes” he said, oh probably. (like I would say much anything other than cakes!). I set to work and got my ingredients together. After mixing the batter I thought it looked a little too thin for my liking, but I tried two pancakes first anyway. It was too thin. They were not going to puff up with the batter so thin, so I added more. The original recipe also calls for pecans but I eliminated them. I knew putting something in the pancakes was going to already be something that would make Grumpy give me a look, so I left the nuts alone. When I asked him how he liked them his response was, “I could do without the chocolate”. what? LOL Yeah. He’s a little on the nutty side himself. I loved them and probably would love them with the nuts also. 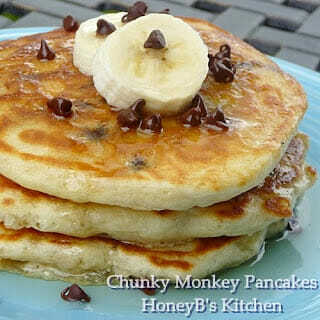 So, if your looking for a different pancake to make and Chunky Monkey appeals to you, then go ahead. Try them! Stir together flour, baking soda, baking powder, salt, and sugar. In a separate bowl, whisk eggs, milk and vanilla. Make a well in dry ingredients and pour milk mixture into well, immediately pour in melted butter. Whisk until blended. Fold in banana and chocolate chips. Cook on griddle coated with baking spray until tops of pancakes start to bubble. Flip and cook another 30-40 seconds or until pancakes are cooked through. Top with banana slices, a few mini chocolate chips and pure maple syrup! 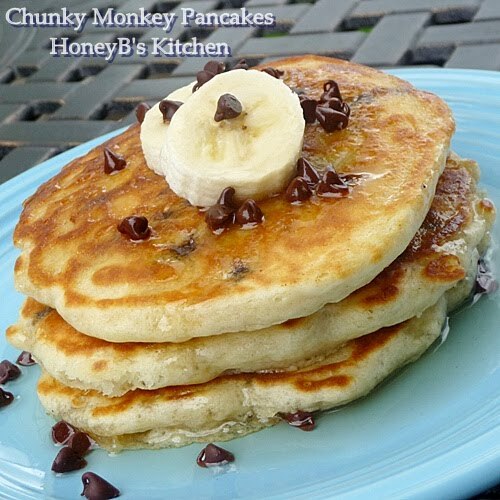 CHUNKY MONKEY BREAKFAST CAKES – PIN IT! « I’m a pasta lovin’ seafood eatin’ fool! Bananas and chocolate is a combination that's hard to beat. I would love a stack of these cakes this morning. That's my idea of a great breakfast any time of the morning. I just cracked open the maple syrup for another project but could easily go for pancakes. Funny I noticed these on Allrecipes this morning when I was looking at zucchini bread recipes. Yours look scrumptious. will be trying these next love the combo and you know we are pancakes lovers here too! they look awesome! Pancakes are my downfall. Once I start eating them I can't stop! Your pancakes look PERFECT! YUM! They look divine! And well done you for working out before eating one. I think I'd probably skip the work out and just go straight for the pancakes. Wish this would have landed in my inbox yesterday, had a house full of 17 year old boys, would have been the perfect Sunday morning breakfast, no worries, there's always next weekend, I tend to have a house full every weekend. Thanks for sharing, these will disappear quickly! Ohh…this pancake looks fantastic. It's just like my ideal pancake. I'm going to try this pancake soon and thank you for sharing this awesome recipe. A wonderful pancake indeed Shelby! Pancake time again! Love that slogan, and any time of day for that matter! Oh, yeah! Love this recipe. Lots of favorites in there with the chocolate and pecans!! Great recipe, Shelby. This does look good. I think I'd swap the chocolate for butterscotch though. Thanks for sharing. Banana + chocolate = happiness! Hot chocolate chips and bananas in these pancakes sound amazing! Such a great treat after a workout. What a great combo. My daughter loves banana pancakes and if I had the choclate she will be so excited! Thanks for Sharing!! Wow Shelby! I'm just about ready to head out to breakfast so this is looking mighty good to me! Just had to Pin it to the Allrecipes board that I contribute to.